Here’s an all-new model from Swift that should have you sitting up and taking notice. Not just because it’s a narrow-bodied, low-profile coachbuilt, but let’s go to the main talking point – at the back, an all-GRP top-hinged tailgate that takes up nearly the whole of the rear, literally opening up a world of possibilities. 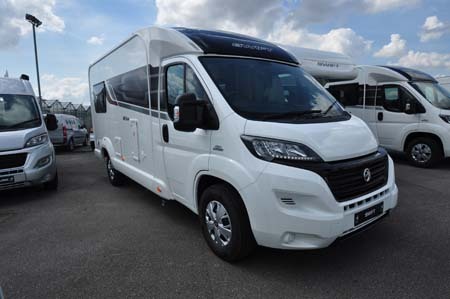 It’s a rather high step up in here – and you lose the electric retractable step altogether if you go for the towbar option – but you enter a rear lounge comprising twin settees facing each other. This also leaves space for carrying items (bikes and boards etc) for travel – with Swift providing handy lugging points at floor level. The sleeping arrangements are straightforward, too. Choose between two singles (1.84m long on the offside; 1.80m, nearside; both 70cm wide), or pull the settee bases together for a transverse double that’s a generous 1.95m x 1.80m. Cushions are commendably flat, too. 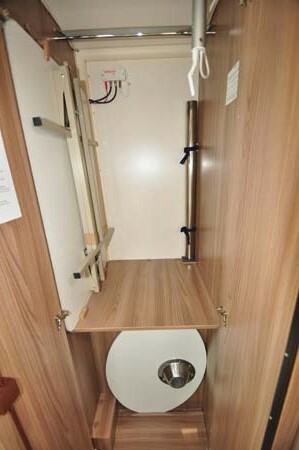 There’s also proper habitation door access – on the UK nearside, of course – with a mid-‘van area that’s split between a proper kitchen (nearside) and a washroom directly opposite. The former centres around Thetford’s new Caprice 2 full cooker (with easier to operate controls). The sink butts onto this, allowing space for the add-on drainer and/or chopping board. Complementing all this is an under-the-counter Dometic 8-series fridge (with removable freezer box) and, overhead, a microwave oven flanked by two large cupboards. 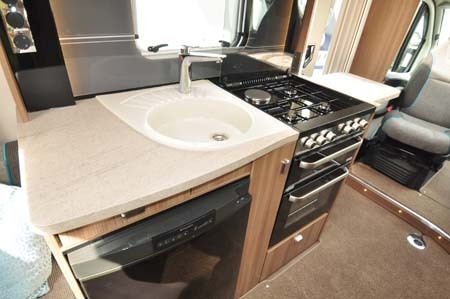 It definitely adds up to a proper motorhome kitchen, with no need for added extras. The washroom, too, has a swish new look to it, with special mouldings for the sink and wall units. There’s a Caraflo mixer tap here that also extends out to be the showerhead, with water-saving trigger operation. The clingy curtain is a bit of a throwback, however, as is the use of wallboard. And there’s only a rooflight for ventilation. 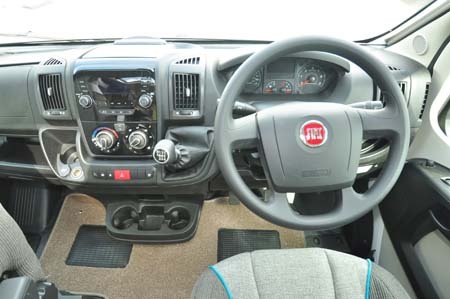 Meanwhile, the front end more than makes the most of Fiat’s latest Ducato cab. In latest guise it not only looks that bit sharper, it also comes with an improved stereo (including Bluetooth and USB connectivity). There’s sufficient automotive power from the standard 2.3-litre, 130bhp engine allied to a six-speed manual gearbox. Automatic transmission, too, will feature on the options list. It’s the long-wheelbase chassis, which promises a good ride and keeps tail overhang fairly minimal. Also upfront, there’s a second lounge – both cab seats (note the captain’s styling) swivel and an offset oval table on a single pedestal leg can be added here. 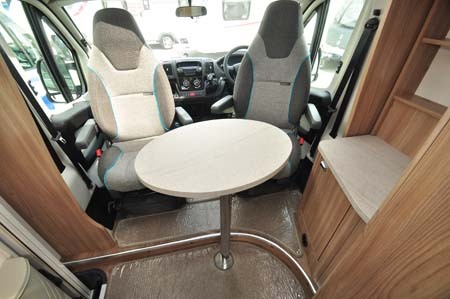 Indeed, the furniture unit immediately behind the driver is also handy as an occasional countertop, especially for a TV (you can also watch the box in the rear lounge, thanks to appropriate sockets and a flatscreen holder fitting). Furniture has the glamorous sounding Aralie Sen finish, while the soft furnishings (called Loxley) get a lift thanks to a cornflower blue piping and patterning. 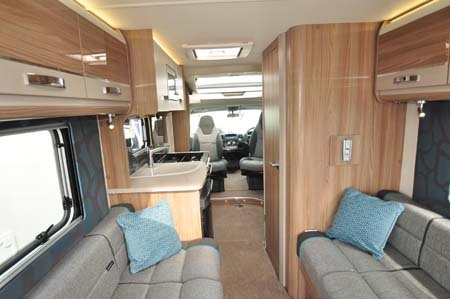 The standard specification goes on to list such sought-after features as concertina blinds, rear speakers, LED ambient and direct lighting (with dimmable adjustment for the individually switched reading lamps), proper locking to all interior doors etc. 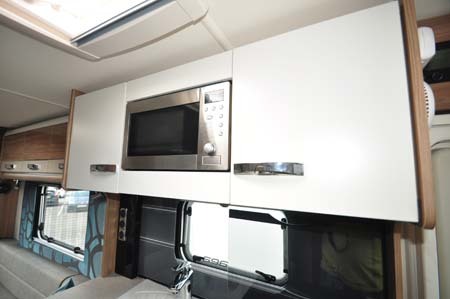 Truma’s Combi 4 heating and hot water system with CP Plus controls, including a timer, in conjunction with a Winter Pack (fresh and waste water tank heaters, drain insulation and fridge vent etc) mean this vehicle reaches the highest Grade Three insulation levels. 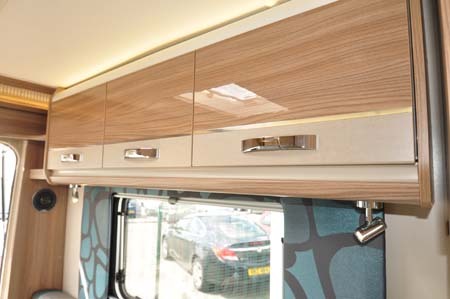 With Swift now adopting its SMART bodywork technology for its motorhomes – it’s just enjoyed its first full season on its tourers – there are all the benefits of a wood-free construction that uses polyurethane and comes with the backing of a ten-year warranty. 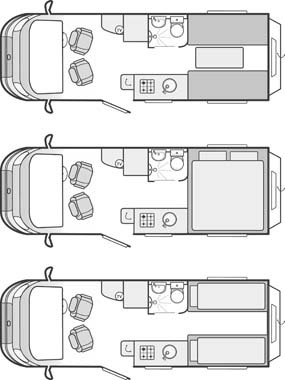 Look out also for sister model Rio 340 – it’s elevated to four-berth status thanks to an electric drop-down bed over a shorter lounge that includes travel seating for two. 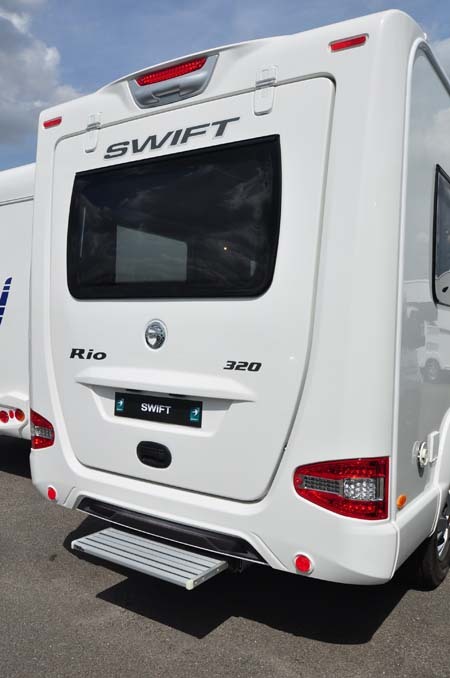 There’s more information on the Rio 320 on the Swift website and to find out more about our low-cost premiums visit the motorhome insurance discounts page. We ordered a Swift Rio 320 at the NEC was given a March/early April delivery now have been told that Swift have changed the delivery date now to late June/early July not very happy with this news great to here they had record sales, but missed delivery dates are not very good for their customers is it!!!! Thanks for the comment Janet. I’m sure it will be worth the wait. The Rio looks fantastic. 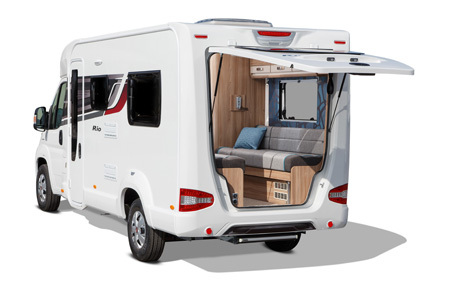 We were very impressed with the Swift Rio so much so we ordered one and was surprised that the Lux pack was free if you ordered at the show saving a cool £995.00 so looking forward to picking it up in March. Hmm…very nice. I’m sitting on the beach in St Tropez bay in my van the precursor to this one. Having been living in it (i.e. on holiday in Europe for 7 weeks now) I have found this one a little ‘snug’. Its the Forte so for 4 people but housing myself and my dog and still snug!. Looking at the new 2015 model, I had already decided to upgrade next year to a lager vehicle maybe of a different manufacture and this one looks good to me. It has the option of the two single beds (I think the best option for life on the road) or a good size double. My bed (a double) is a little short and I find that I am bumping feet or head or both. Ok for short stays but annoying after so many weeks, but being on the beach at 32+ degrees in St Tropez makes that annoyance disappear fast. 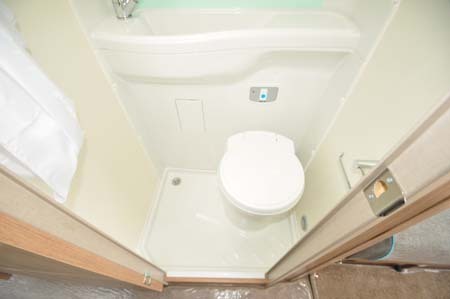 I really like the extra room at the front of the new 2015 vehicle, and the extra space in the toilet. This has been given lots of thought and they have come up with a new refined model of mine the Peugeot Boxer Forte by Autocruise (aka Betsy Blue). I will definitely think of trading up to this model in a years time. Thanks for the comment Vivienne. Sounds like the Rio might be just what you are looking for.